The St. Louis Circuit Court was the very first courthouse opened in St. Louis in 1828. For more than 180 years, the St. Louis Circuit Courts has stood as one of the most storied and significant courts in the entire country. 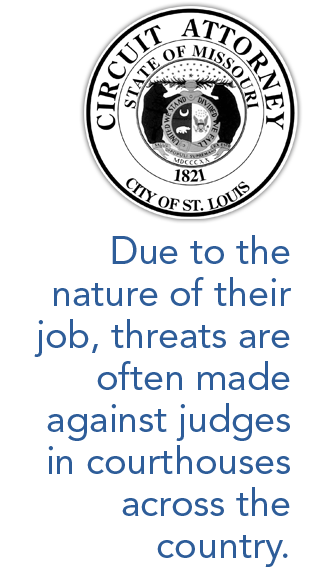 Today, the St. Louis Circuit Court conducts more than 300 jury trials annually and staffs both a juvenile court and detention facility. It also operates a drug treatment court for nonviolent offenders and is active in public education through the city’s schools and community groups. The St. Louis Circuit Courthouse’s top priority is to protect the people that are inside of the building at any given time. This includes law enforcement, municipal workers, judges, etc. Due to the nature of their job, threats are often made against judges in courthouses across the country. The St. Louis Circuit Court is no different and the decision-makers were looking for an added layer of security beyond the armed guards that are continually on duty. When Sheriff James Murphy, whose office secures the courthouse and transports prisoners, heard that several retired St. Louis law enforcement officers started a security technology company, he was anxious to hear more about their ground-breaking facial recognition technology, First Line Facial Recognition. Blue Line Technology was launched by retired law enforcement and military professionals to be an industry leader in both threat detection and access control. Joseph Spiess, a retired Major with the St. Louis Police Department and a certified expert in workplace and school violence prevention strategies, is one of Blue Line Technology’s founders and senior partners. With more than 32 years’ experience as a former police officer, Major Spiess is currently working as a trainer for the National Sheriffs’ Association and the Department of Homeland Security. Another Blue Line Technology Senior Partner, Thomas Sawyer, was involved in long term, conspiracy investigations as part of the Organized Crime Drug Enforcement Task Force Initiative. These investigations were often marshaled using several surveillance strategies, including court-authorized telephonic Dialed Number Recorders, electronic eavesdropping of residences/businesses and Title III intercepts of phones, pagers and computers. Blue Line’s breakthrough technology, First Line Facial Recognition, is a state-of-the-art surveillance system that can capture a subject’s face faster and more accurate than any technology on the market. 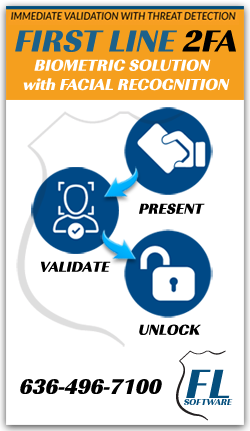 To implement First Line Facial Recognition, the courthouse developed a database custom-designed for its specific needs. The software was set to monitor, detect and alert the user when a threat or unknown subject’s face is captured. If the face is identified as a “threat,” access is denied and an alert is sent. This software is significantly different from other biometrics as it happens in real time and while the subject is on the move. The software took less than a week to install and has already had potentially life-saving success. There was a particular individual who made a threat against the judge in the Circuit Courthouse. The judge had reason to believe that this individual was someone that was a real threat to everyone in the building. Accordingly, they deployed two armed guards out front who were given a picture of the individual and told to make sure and keep an eye out. Unfortunately for the officers tasked with guarding the building, the individual in question had lost roughly 50 pounds from the time the picture was taken. His face had slimmed down and the officers simply missed him. However, because the First Line Facial Recognition software was installed, the cameras picked him up at the entrance and he was immediately apprehended by law enforcement. The key is matching state-of-the-art technology with human response. First Line Facial Recognition’s approach allows for an almost instantaneous match and thus, quick reactions to security problems. This breakthrough facial recognition technology is a significant step in the field of biometrics as it can detect a known face in less than a tenth of a second. The software makes entries through turnstiles, metal detectors and as an access control process an effective defense against dangerous subjects.